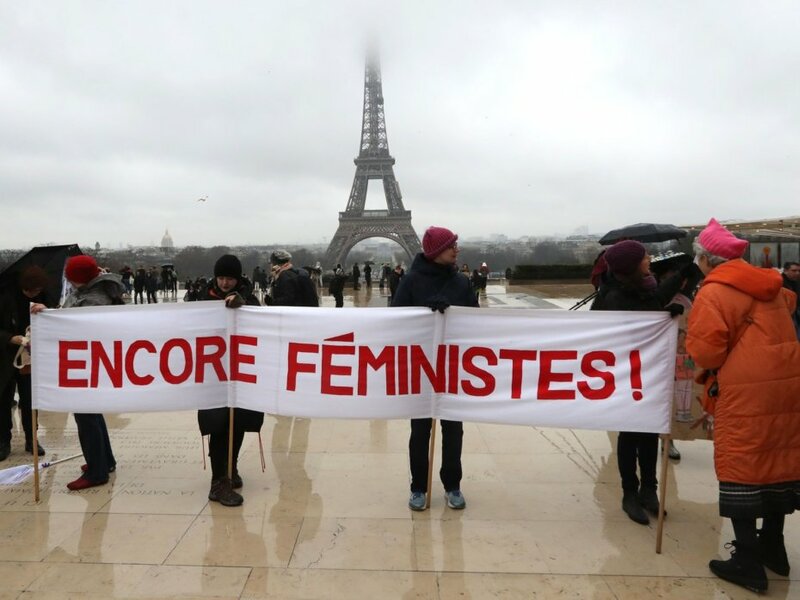 Demonstrators hold a banner reading “still feminist” in front the Eiffel Tower during a women’s march earlier this year in Paris. French lawmakers have approved a measure outlawing sexual harassment in the street, rendering catcalling and lewd or degrading comments a crime punishable by on-the-spot fines of up to 750 euros — or more than $870. The country’s Senate passed the legislation late Wednesday as part of a broader package of measures targeting sexual violence, which the lower house of Parliament advanced earlier this year. The law, which takes effect next month, has been a centerpiece of a yearlong campaign supported by President Emmanuel Macron’s government — and boosted in recent days by a viral video that drew millions of views and waves of condemnation. The film posted last week on Facebook at first appears mundane. Pulled from silent CCTV security footage, it depicts a half-filled restaurant patio where diners sip their drinks and exchange pleasantries. At the top of the frame, a woman in red passes a man with a bag slung over his shoulder. He turns in her direction, apparently cat-calling her, and she turns to reply without breaking stride. Just as she exits the frame in the bottom left corner, the man grabs an ashtray from a table tucked in the top right, and he tosses it at her, sailing the hard object over the diners’ heads. A confrontation between them follows — and then, in a disturbing image, he hits her across the face. After another flurry of heated words, this time between the man and the outraged diners, Laguerre said she walked on to file a complaint with law enforcement. Since her video caught international attention, drawing more than 5.6 million views within a week on the YouTube version alone, Laguerre herself has launched a website — known as Nous Toutes Harcelement, or “We Are All Harassed” — with the intent to collect more stories like her own. That’s a declaration echoed by Marlène Schiappa, France’s secretary for gender equality and the primary force behind Wednesday’s legislation. The law Schiappa championed passed the Senate without a single no vote, and those lawmakers who abstained did so because they believed it did not go far enough, according to German broadcaster Deutsche Welle. But that’s not to say it is free of detractors. Still, Schiappa isn’t deterred by such resistance.